August 28, 2013 - NTSB report indicates owner of a Socata TB 10 "Tobago" knew aircraft was not airworthy at the time he took the buyers up in a pre-purchase flight examination and was told the day of the crash the aircraft should not be flown. Approaching retirement Erik and Jane Unhjem of Goshen, New York “wanted to tour the national parks out West, from the air.” Erik had obtained his pilots license back in 2005, and the couple had been renting aircraft flying up and down the east cost but they wanted their own. The Unhjem’s had searched the internet for an airplane for sale and came across a French made four passenger light single engine aircraft, the Socata TB 10 "Tobago", tail number N5542Z which was manufactured by Socata. The Umhjem’s contacted the owner David McElroy of Long Island, also a certificated private pilot, and for over a year they had been in correspondence with McElroy in regards to the cost, maintenance that had been done on the aircraft and setting up a time to see the aircraft. By the end of July McElroy finally had reported to the Umhjem’s the Tobago had a completed annual and that there was another buyer interested in the plane, the cost $50,000. On August 19, 2012, the Umhjem’s drove to Brookhaven Calabro Airport, (HWV), Shirley, New York to examine the aircraft, review its logbooks and to take a test flight and if they were satisfied they would move on to the next phase of having a pre-purchase examination of the airplane from a maintenance facility that specialized in the Socata. McElroy taxied the aircraft to the runway and then handed the controls to Erik for takeoff. Erik provided full throttle and the aircraft began its roll down the runway. However, the aircraft’s acceleration was slow. At 65 MPH Erik pulled back on the yoke but he could not get the aircraft off the ground, running out of runway he handed the controls over to McElroy who continued with the takeoff. As McElroy continued the takeoff, at the same time another pilot announced over the airport’s common traffic advisory frequency, “Tobago on takeoff, check your carburetor heat.” McElroy and Erik looked and confirmed that the throttle, mixture, propeller, and carburetor heat controls were all in the “full forward” position. The aircraft used almost the entire length of the 4,000-foot-long runway before it climb to about 150 feet, still in ground effect the aircraft stalled, and then crashed into a residential neighborhood. The aircraft came to rest upside down. The aircraft burst into flames, Erik and his wife were ejected from the aircraft, and McElroy remained seat belted in the aircraft. Jane Unhjem and McElroy died, Erik suffered burns over 60 percent of his body. According to FAA records, the airplane was manufactured in 1991 and was issued a ferry permit on June 20, 2012, in order to relocate the airplane and perform an annual inspection and other maintenance at HWV. Although the maintenance records were not recovered, the investigation revealed a two-page handwritten list of discrepancies for the airplane, prepared by the mechanic who relocated the airplane to HWV and was performing the maintenance on it. Erik stated that the airplane had been posted on the internet for sale, but that the owner did not reply to several requests to see the airplane and its records. He and his wife flew to Mattituck, New York, where the airplane had been parked for several years, to examine the exterior of the airplane. Afterwards, they continued to try to contact the owner. After several months, the owner finally responded to the buyer and informed him that the airplane had been flown to HWV for an annual inspection and correction of maintenance discrepancies in preparation for its sale. Prior to the buyer’s examination and test flight of the airplane at HWV, the owner represented to him in emails, text messages, and over the telephone that the annual inspection was completed, that there were no outstanding discrepancies, that the airplane was airworthy, and that it was ready for sale. The mechanic who was working on the aircraft had reported to the FAA investigators that he did not complete the annual inspection because of the faulty tachometer, and because the pilot had complained about a lack of engine power following a flight in the accident airplane on August 16, 2012, 3 days prior to the accident. He stated that he made no effort to troubleshoot the engine power issue, because the airplane’s tachometer was not operational. 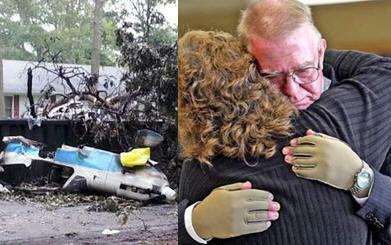 The owner had a friend accompany him on the flight 3 days before the crash. In an interview, the friend explained that the airplane "would not climb properly" and never reached an altitude above 300-400 feet. The friend heard the owner complain to the mechanic that the tachometer was inoperative and that there was "something wrong with the power" that prevented the airplane from climbing normally. The mechanic reported to investigators that he brought the airplane into the hangar on the day of the accident for the buyer's inspection, and then subsequently moved the airplane back outside for the owner, and told the owner the airplane "should not be flown." Investigators asked the mechanic for the aircraft maintenance logbooks but he reported he did not have them. The NTSB was unable to locate the aircraft loogbooks.